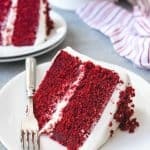 The best Red Velvet Cake has a unique flavor and tender, moist crumb that pairs wonderfully with a tangy, sweet cream cheese frosting. This is a classic cake recipe for a 2-layer red velvet cake that is quite possibly the best red velvet cake recipe in the world. Preheat oven to 350 degrees F. Line two 9-inch or 8-inch cake pans with circles of parchment paper in the bottoms and spray the sides. Set aside. Whisk the flour, baking soda, cocoa powder, and salt together in a large bowl. Set aside. Beat the butter and sugar together on high speed for 3-4 minutes in the bowl of a stand mixer with a paddle attachment until light and creamy. Add the oil and mix again, scraping the sides of the bowl. Add eggs, one at a time, and vanilla, beating on medium-high speed between each addition until combined. Add vinegar and food coloring, adding as much food coloring as needed to get the desired color. If using gel food coloring, it will take less - about 1 tablespoon. Turn mixer to low speed and add the dry ingredients alternately with the buttermilk in 2-3 additions, mixing just until combined between each addition and scraping the bottom and sides of the bowl as needed. Transfer batter to the prepared pans and bake for 30-35 minutes (for 9-inch pans) or 38-43 minutes (for 8-inch pans) until a cake tester inserted in the center comes out clean with just a few crumbs. Do not overbake. Remove from oven and cool completely. Beat the cream cheese and butter together in a large bowl using a handheld mixer until smooth, about 1-2 minutes. Add the powdered sugar and cream or milk and mix on low speed until incorporated, then increase speed and beat for 2 minutes. Add vanilla and salt and beat again. Level the cakes (if needed) so the tops are flat. Save scraps to crumble and use for decorating. Frost with cream cheese frosting and sprinkle the top of the cake with the reserved crumbs. Slice and serve. Cover and store at room temperature for 3-4 days or in the fridge for up to 7 days.